It may come as a surprise to learn that the union the UK is trying to extricate itself from features a LOT. It’s almost like we don’t want to leave. Anyway, Brexit aside, these are the top travel destinations you must-see in 2019, according to the British Association of Travel Agents. Happy Holidays! The Balkan nation has long been a popular holiday destination. In 2019, the city of Plovdiv will be the European City of Culture and that’s certain to bring it to the attention of more travellers. As well as Plovdiv, Bulgaria offers the beautiful capital city of Sofia and the UNESCO listed coastal town of Nessebar. Bulgaria also offers a host of quality Black Sea beach resorts. Poland has transformed itself into a go-to destination for city breaks, as well as ski and adventure holidays. With Ryanair offering so many destinations, it’s an easy holiday target for 2019. Poland is full of history, has amazing food, and stunning countryside. Krakow is one of the prettiest cities in Europe, with a historic market square to rival any other. The island of Madeira is an autonomous region of Portugal. The main focus of attention is the islands’ capital city of Funchal, which is a popular hub for cruise ships. Madeira offers the perfect slow-paced trip with quality beaches and an abundance of relaxed bars and cafes. For culture vultures, there’s plenty of historical attractions and outdoors junkies can indulge in the sparkling clear waters, snorkelling and hiking. The Greek port city was decimated by fire in 1917 but has emerged from the rubble to become one of the Mediterranean country’s coolest hangouts. Thessaloniki is a real mixture of old and new and retains many Roman, Byzantine and Classic Greek features. Thessaloniki offers culture, history and world-class beaches to visitors and is the second largest city in Greece. The city is famous for its art nouveau and art deco buildings. Ryanair starts a direct route from Manchester to Thessaloniki in April 2019 to add to the existing route from London Stansted. The autonomous region of Galicia is in Spain’s north-west coast and known throughout the country as the ‘Land of 1000 Rivers. The Galicia region is green and verdant and boasts stunning cities within its Roman walls. One of the most famous in Galicia is the capital, Santiago de Compostela. The city is the final stop on the pilgrimage ‘Camino de Santiago or ‘The Way of St James’. The centre of Santiago is also UNESCO World Heritage Site. Other cities in the Galicia region are equally beautiful and include A Coruna, Lugo, Pontevedra and Ourense. Uzbekistan sits between a few other ‘Stans in Central Asia and is in the unique position of being double landlocked. This means, not only is Uzbekistan surrounded on all side by other nations, but those nations themselves are surrounded. Pretty cool, right? You’ll thank me when it comes up on Pointless. The Uzbek capital city of Tashkent was destroyed by an earthquake in 1966 but has been rebuilt in a mixture of modern and Soviet-era designs. 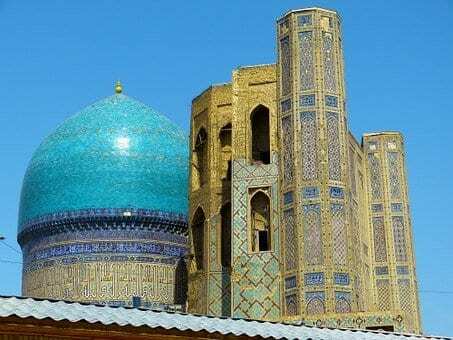 The cities of Khiva, Bukhara and Samarkand were 3 of the most important on the Silk Road trading route, and remain important parts of Uzbek history and culture. These days Uzbekistan provides most of the electricity for its neighbours. It also the world’s largest open-pit gold mine. The visa rules have recently changed, which makes it easier for visitors to travel to Uzbekistan without all the paperwork. This makes it a great addition to the top travel destinations for 2019. Durban is a coastal city on the eastern edge of South Africa, sitting on the Indian Ocean. It’s SA’s third largest city, after Johannesburg and Cape Town, and is the nation’s busiest port. Durban’s famous for its warm climate, Afro-Caribbean culture and expansive white sandy beaches. Durban won the right to host the Commonwealth Games in 2022 but withdrew in 2017. Birmingham has since taken its place. Durban is a hub for sport, with major rugby, football and cricket teams calling the city home. The south-east Asian island nation is steeped in culture and tradition and, like most other countries, has seen some pretty dark times. The capital, Tokyo, is one of the most populous cities in the world and never sleeps. Nagasaki and Hiroshima are best known for atomic bombs, rather than for their important logistical and cultural contribution to Japan. As well as the mainland, Japan has many islands. Honshu has always been a popular draw. As with the rest of the nation, it’s a great mix of cutting-edge technology, neon lights and ancient traditions. It’s no lie to say I’ve wanted to visit Jordan for years. I would love to add Petra to the list of places I’ve explored, but Jordan has more to offer than just treks into the red desert. The nation also boasts the restorative powers of the Dead Sea, as well as the historical sights of the capital, Amman. WA covers almost one-third of Australia and is mostly outback. Perth is the state’s capital and the only city in Western Australia with more than 1m residents. Other cities are much smaller with Rockingham in second place, with a population of a mere 46,000. What WA lacks in massive cities, it makes up for with beautiful coastline, laid-back towns, and a whole lot of wine. Margaret River is a great place to tour and pick up some amazing Aussie wines. Broome, Bunbury, Freemantle and Rottnest Island are ever popular destinations for visitors. Denver’s a great city, and it deserves its inclusion on the list for 2019. There’s a ton of culture and history to uncover in the Colorado capital, and Denver is also world-famous for its love of sport. Costa Rica is a Central American country, with coastlines on both the Pacific and Caribbean. The nation is famous for its wildlife, rugged volcanic mountains and white sandy beaches. It’s considered to be one of the most bio-diverse countries in the world and it has a thriving eco-tourism industry. Travellers can enjoy tropical rainforests and diverse wildlife in one of the many national parks, or simply relax on the beach and take in the sunsets. If you’re in the mood for pampering, many Costa Rican resorts offer ‘splunch’ (spa with lunch). This might be the best mix of two words I’ve ever heard. I’m considering booking a flight for this alone. Do you have any of the must-see destinations for 2019 on your list? *That’s not true at all. I wouldn’t pay any money for that.